We would like to invite you to our stand, to discuss the latest developments, over a cup of coffee. We hope to meet you in Hall 10! 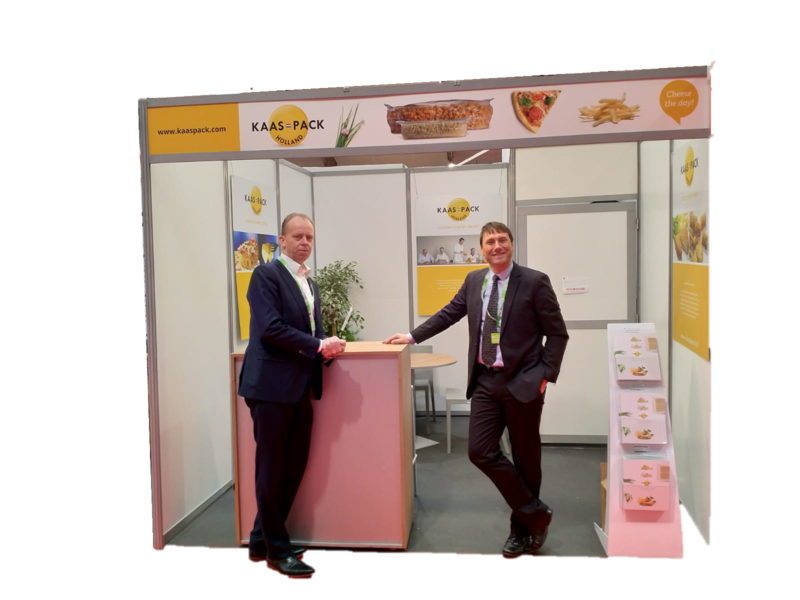 Kaas-Pack Holland is present at the CFIA in Rennes France, March 12-13-14th. 2019. We would like to invite you at our stand: Hall 4 stand D18. Our sales manager Erwan Le Pelvé will be happy to help you find your perfect cheese solution. Kaas-Pack Holland sera présent au CFIA à Rennes France, du 12 au 14 mars 2019. Nous vous invitons à venir nous voir sur notre stand: Hall 4, stand D18. Pour plus d’information, merci de prendre contact avec notre responsable commercial Erwan Le Pelvé. The launch of our new website last year was the first chapter of a large-scale project within Kaas-Pack. Developing our website has also, as is the case with these types of projects, prompted us to give a great deal of thoughts to our values, products and services. As Kaas-Pack, we want to be defined by the way we do our work, which is with pleasure and dedication. These may well be soft values, but they are values that have an impact on the whole process. We have developed a slogan – Cheese the Day! – so that we can also radiate this message with our products. A cheerful greeting to our customers which also reflects our enthusiasm. One important aspect of our product is the packaging. This should protect the cheese and make it easier to use within your processes. We have carried out a variety of tests on different forms of packaging, boxes and pallet loads in order to reach an optimal solution. We have designed new labels, films and boxes displaying our Cheese the Day! slogan so that all our customers will be aware of our new, optimised packaging. We are delighted to present this new look to you; something familiar and at the same time a quality guarantee for a fine and honest product. We hope that you are as enthusiastic in processing our products as we are in producing them for you! Cheese: an everyday, tasty product that can be used in so many different ways. At Kaas-Pack we turn an everyday product into something inspiring. Kaas-Pack Holland will be present at the CFIA in Rennes France, March 12-13-14th. 2019. We would like to invite you at our stand: Hall 4 stand D18. For more information please contact our sales manager Erwan Le Pelvé. Kaas-Pack Holland will be present at the CFIA in Rennes France, March 13-14-15th. We would like to invite you to our stand, to discuss the latest developments, over a cup of coffee. We will inform you later on the exact location. For more information please contact our account managers. We would like to invite you to our stand, to discuss the latest developments, over a cup of coffee. We would like to inform you about our VLOG certification and our product optimisation. We welcome you in a different location than we/you are used to. Next time, we hope to meet you in Hall 10, our familiar spot! You can find us in Hall B1.0, Aisle No. 050.